The rally was held on the 100th anniversary of Belarus' independence from Russia. At least 70 people were arrested by police, according to journalists on the scene. Police in the Belarusian capital, Minsk, on Sunday arrested scores of protesters who attempted to hold a march. 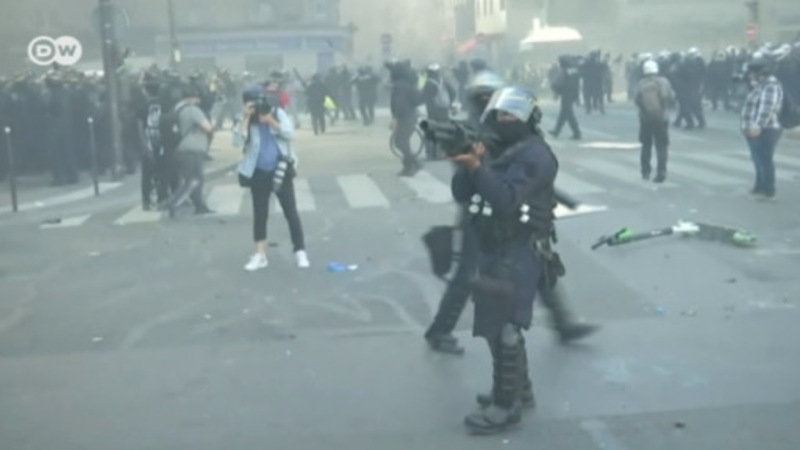 Journalists at the scene said at least 70 people were detained by police. Among those arrested were opposition politicians Mikola Statkevich and Vladimir Nyaklyaev, as well as 12 rally organizers. A 90-year-old man was also taken into custody. The rally came on the 100th anniversary of Belarus' proclamation of independence from Russia in 1918 to form a republic that lasted only until 1919, when it was conquered by Soviet Russia. On Friday, authoritarian President Alexander Lukashenko dismissed the country's fleeting independence, calling it a "dismal page of our history." The human rights group Vyasna accuses Lukashenko of deliberately trying to erase Belarusian identity and "Russifying" the former Soviet republic. Vyasna said five of its observers were among those detained by police. The political opposition typically attempts to rally on the country's independence anniversary. The government agreed to a "Freedom Day" concert, and thousands turned out for it on Sunday. Yet despite the government banning any protest or march, many people carried the red and white flag of the 1918 republic, which has become an opposition symbol. Last year more than 700 people were arrested at the March 25 rally, prompting warnings from the EU, which had lifted sanctions on Belarus after Lukashenko freed imprisoned opposition politicians in 2016. Political observers said Lukashenko allowed the holiday to be celebrated to avoid a repeat of last year's unrest and the prospect of a new reprimand from the European Union. "This topic came up during Lukashenko's meeting with EU commissioners," said analyst Alexander Klaskovskiy. "Europe sent a signal that authorities should let people celebrate the 100th anniversary of the Belarusian People's Republic." Lukashenko has been in power since 1994. He has strangled opposition activities and independent news media throughout his rule, although he stepped up the crackdown after his 2010 re-election, throwing dozens in jail. Unrest over a sharp increase in fuel prices had got so bad that Zimbabwe President Emmerson Mnangagwa cut short an investment-seeking trip to Europe. He promised to investigate "unacceptable" violence by security forces. Authorities have not spelt out why Paulyuk Bykowski, who works for Deutsche Welle's Russian service, was taken into custody. The ex-Soviet country has escalated its crackdown on independent journalists in recent months.